studiono8: We Have a Blog Candy Winner! WOW Thank You to Everyone! Nancy please e-mail me privately here with your name and address so I can ship this to you ASAP. Again thank you for participating and I look forward to giving away more Blog Candy in the coming weeks. CONGRATULATIONS, Joann! Those hits and mentions are well deserved, as you are mighty talented! Enjoy! YAHOO oh the hits, congrats. I've been following your site recently, however I'm not exactly sure how I got to you. I think it was because of the Kwernerdesigns.com challenges. Anyways, I'm new to crafting, and love blog surfing for inspiration. I am loving it. I'm not a SU demo, but I did place my first ever order with SU last month. Yes I am a demo too...and love it.. Congratulations!! Your work is stunning!! I stumbled upon your blog one afternoon blog hopping! Which blog led me to yours? Well, I'm not too sure! LOL! I am not an SU demonstrator but have been recently intrigued by all the awesome creations and have been attending some of the classes one of the SU demonstrators in the area give! I think I'm addicted! LOL! Congratulations on all your hits!! Your work is beautiful and very inspiring. I found your blog through Nancy's ipicks. Thanks for the chance to win! Thanks for getting back with me about the wedding invites. Your tips were great! I so love your stuff. Maybe its all about being a graphic designer. Cause you guys can really put together nice cards! Congrats on the hits! COngrats on your success! I don't remember exactly how I found your blog. I think it might have been from Josee Smuck's blog. I think. I am from Canada and I am not a demonstrater. Hey Joann, I met you for the first time at Josee's the other week....and since then I've been hooked on your blog... I also check Shannon's too :). Being a newbie SU demonstrator.. I love ladies like you who put together something so simple...so beautifully. Can't wait to see more inspirational ideas... Thanks for the blog candy... great idea!. Something I'll plan on doing once I get my blog up & going... so much to play with...so little time in the day! How do you manage it???? I AM a demo, though a NEW ONE. lol.. I found your blog via the color challenge posts at kwernerdesign blog. Rest assured you are in my favorites now! Good luck everyone commenting for the candy! Jo - you are one awesome lady! Congrats! And I just got another baby shower invite in the mail so I will be ordering one of your onesies gift sets. She'll love it! Congratulations! 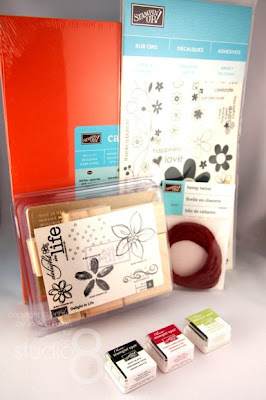 I love seeing what you do with my favorite stamp set- Fifth Avenue Floral! Thank you for sharing all of your wonderful ideas and crafts with the world! Keep up the great work! Congrats on all the hits - although I am not surprised. You are truly talented and have came up with some AMAZING projects! I can't quite remember how I stumbled across your blog, but I do remember being in "awe" of all the things I saw. I am a demo in Illinois and I have been stamping for about 2 years. Thanks for the chance at your blog candy and will definitely keep on eye on what you are up to. You are truly an inspiration! You are awesome and your website is so inspiring.. I'm from Mexico but I live in the States, I'm an SU demonstrator.. next month It's my first anniversary with SU!!! Anyway, I found your website from Nancy Riley Ipicks, and from Kristina's Challenges.. Thanks for sharing your ideas, you are so so so so talented!!! Congratulations on all your hits! I can't remember how I came across your blog, but I know it had to do with your awesome wedding invitations. Thanks for the chance to win your blog candy.